Take The Escapist's Videogame Zombies Quiz! How much do you know about the digital undead? Zombies are one of the classic videogame villains, right up there with aliens, demons, and Nazis. They're mindless monsters that (usually) only exist to attack and consume; gamers can hack, punch and shoot away at them absolutely guilt-free! After all, they're already dead, so it's not like what you're doing is murder, right? 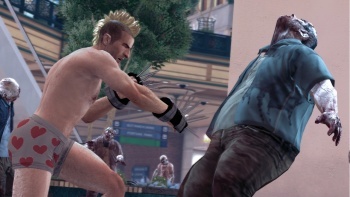 To celebrate this week's release of Dead Rising 2, which sees protagonist Chuck Greene battling armies of literally thousands of zombies in a casino, we thought we'd put together a quiz about zombies and the games that feature them. You'll need to have a pretty wide range of zombie-hunting knowledge to ace this quiz, but don't worry: You can take this as many times as you like - but as always, your time will be reflected on our leaderboards. Grab your shotgun and plants of choice, get ready to guard your delicious brains, and take our zombie quiz here!